Like all cetaceans Humpbacks are endangered. Their status varies somewhere between critical and imminent extinction depending on the list and who is making the prediction. The total world population may be as high as 50,000 which would represent a few percent of their numbers before whaling. 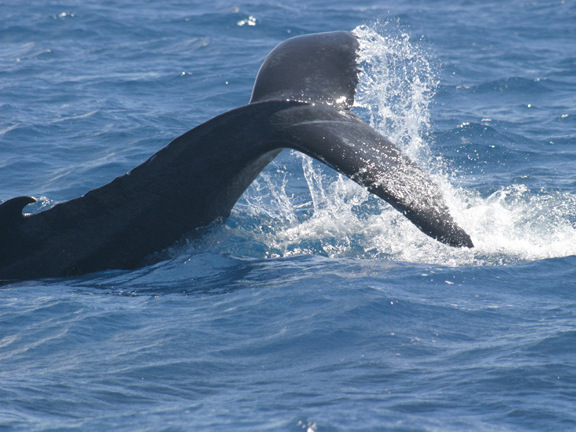 Humpbacks are so named because of the arch of their backs under their dorsal fins as they sound. The first part of the scientific name “Megatera” is a Latin description of their “large winged” appearance as they fly through the water (or even through the air) on white flippers over a third of the length of their bodies. The second part “novaeangliae” means from New England and refers to whaling history and where the ships that commonly killed them were based. 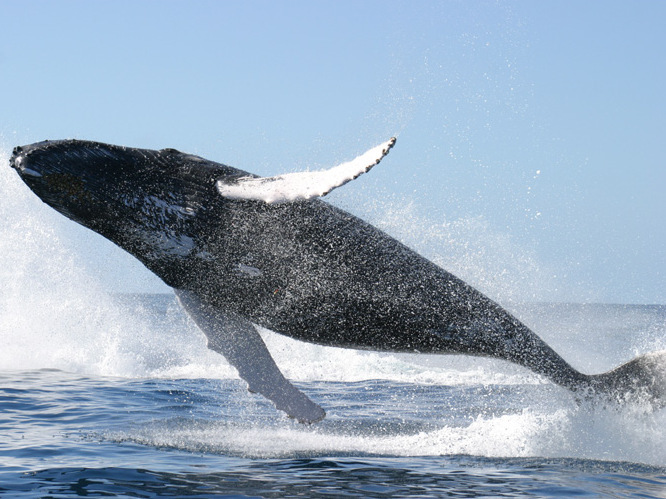 Costa Rica is unique for whale watching because both northern hemisphere humpbacks from California and Canada (December-April) and their southern hemisphere Antarctic cousins (July-November) winter in the warm tropical waters. Despite the geographic specificity implied by their scientific name, they are one of the most widely dispersed animals ranging through almost all of the worlds seas. Where they feed in the summer defines three major populations: one in the southern hemisphere and Antarctic, another in the north Atlantic and the third in north Pacific. Each group migrates to the equatorial tropics to mate and bear their young and all three send pods to Costa Rica. They trap schools of small shrimp using a hunting technique unique in the sea. Bubble net feeding is an incredible display of cooperation where one or two whales swim circles around the target while releasing a continuous stream of air from their blowholes. They come up from below encircling the fish or krill in a net of bubbles trapping them between walls of air and the surface. The other members of the pod crash through the concentrated food source feeding at will. In addition to giving them their names Humpback’s physical features are used to identify them. They’re usually dark gray except for their flippers, undersides and tail flukes and photographs these lighter markings are used by scientists to identify and track the whales over their migrations. Humpbacks have warty protuberances called tubricales around their heads and on the edges of their flippers that aren’t found on other whales but these are not used for identification because they are more difficult to photograph and categorize than the fins and tail. Southern hemisphere humpbacks are larger and can exceed 18 meters (60 feet) in length and fifty tons, their cousins in the north are rarely longer than 15 meters (50 feet) and usually less than 40 tons. 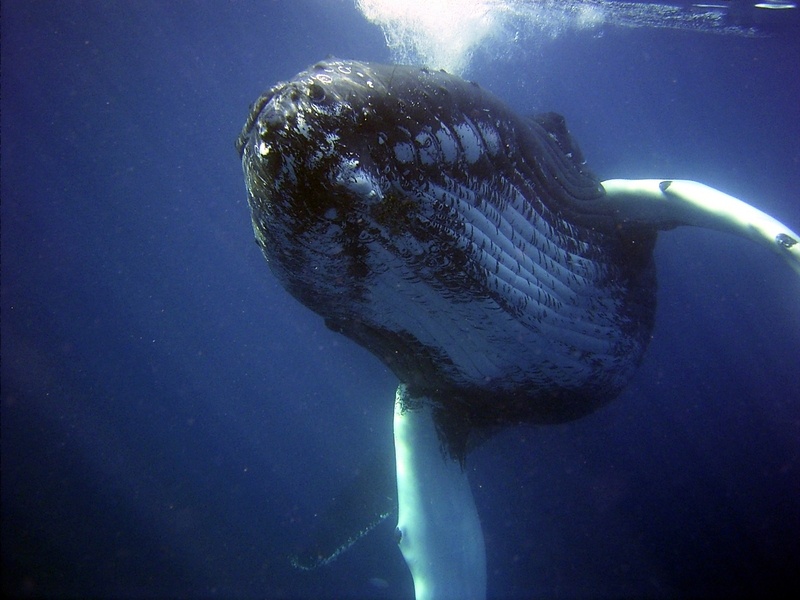 Humpbacks are the authors of the “whale song” that may travel thousands of miles at frequencies beyond human detection through deep water channeling. The songs are sung by males poised nearly motionless head down in the water. Whales and other cetaceans do not have vocal chords and the sounds they make are generated by compressed air pushed through their nasal cavities. The twenty minute overtures repeat with minor variations and may communicate challenges, dominance and overtures to potential mates.